As we look to integrate technology into classroom lessons, the SAMR model is one framework that can guide teachers towards meaningful integration. Although it is not possible to redefine every lesson, we know that students respond favorably to lessons where they are actively engaged in their learning. Part of engaging students is how they are engaged. When students are producers of content, they are actively engaged in their learning. Whereas when students are consumers of content, they are more likely to be passively engaged in their learning. Having students create digital books is one way to actively engage students as producers of content. The tools and their features are outlined in the graphic below. Book Creator is a web and app-based tool where teachers can create a library and students author digital books. This collaborative tool allows for students to work on the same book at once and read their peer’s books. Google Slides is a common presentation tool widely used by schools. This tool can be repurposed with a change of some settings to allow for collaboration and hyperlinks. The video clip below shares a visual of how to change the slide settings to resize the slides. This blog post also provides step by step instructions with screenshots. If you are using Google Classroom, you may find it helpful to provide students with a template you create to scaffold the design of the book and select the option “Make a copy for each student” when you post the assignment. Pages is an application that works on Apple devices. Both the Mac and iPad version of Pages provide book templates for students to author their own digital book. Teachers who are curating their own content may also find this helpful to easily drag and drop text, photos, and other multimedia. The robust library of shapes gives students immediate access to clean icons they can use in their ebooks. Storybird is a web-based tool where students select an overall theme for their story and are given images created by artists. Students can author a multi-chapter, multi-page or poem using the image templates. StoryJumper is another web-based tool where students can use built-in backgrounds, props, and import their own photos to represent their ideas. There is also the option for students to purchase their books in hardcover copy. 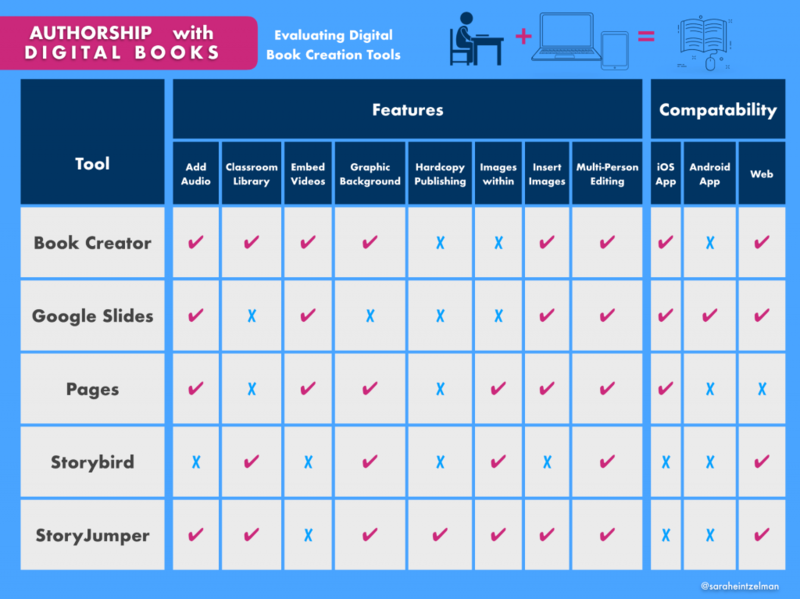 Looking for ideas on how to use Digital Books in your classroom? Visit these blog posts for ideas. This week’s Wednesday Website was shared by high school teacher Lydia Hess. StoryboardThat is a great website to allow students to design visually what they know. The student account is free, and teachers can export students’ storyboards. She shared that students can choose from dozens of scenes to illustrate their own story. In addition, there are a wide variety of characters that can be edited to appear as if they are in motion. Each of the aspects of the story can be labeled, and characters can each have their own speech bubbles. Check out the website for more!